To progress, society doesn't need 'leaders' anymore. This doesn't mean that we won't have great men amidst us. I think great men will come and they will be vital for progress of humanity, but they will be so great that they will refuse to take up this position of leadership. People will not follow the great men, but will listen to their thoughts, philosophies and views and through their sharing, society will find its way forward. Take a look at the Bhoodan (Land Gift) Movement, for example. Because it was entirely executed while walking, there was never any centralized leadership. If you think about it, the Buddha too, walked on foot for thousands of kilometres with a few simple thoughts. Yet, because those thoughts were worthy, and he lived in complete harmony with those thoughts, they have spread across the world and are valid even two and a half millennia later. Any change, any revolution for the people always occurs in one place, but the winds carry them far and wide. Similarly, because we walk, the leadership that is created is always local. In fact, I would like to restate it and say that we aren’t creating local leaders, but local servants. When we approach people as their servants, we appeal to their hearts and they are moved to gift land to their brothers. In fact, our real strength lies in the fact that we are servants. The divinity in each and every person can be witnessed and reached, only when you approach them as a faithful servant. Think of how the various organs and limbs come together as servants to our body. If somebody tries to strike your head, the hand comes forth to protect it. It does not do so out of an expectation or out of fear. It does it because it sees itself as part of the whole and therefore works out of a sense of duty. When we will all see our role in society as servants, we will all light up the sky together like countless stars on a dark night. Don’t think of society as the sky on a full moon night. The moon's harsh light blinds us to the true and humble work of the stars. But on a moonless night, the true servants shine forth, as though they are connected invisibly in this vast and infinite cosmos. Seed questions for reflection: What does being a servant leader mean to you? 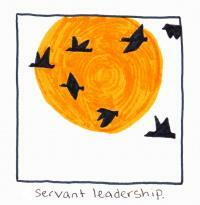 How can we cultivate ourselves to be servant leaders? Can you share a personal story that illustrates servant leadership? What does being a servant leader mean to you? The concept of leadership currently in use in most institutions, from armies to religion, is the top-down pyramid control structure. This limits the freedom of followers and boosts the ego and power of leaders. This is based on hierarchical system of Roman Empire. However, from the perspective of service or dharma, the pyramid is reversed. Service, consensus, Nature, humility and love are the driving force in Dharma and not ego. This dharma-karmayoga model makes service based leadership an obligation and a natural growth of unselfishness and not an option to be avoided or a leadership acquired through force and ego. That is, leadershiip in working for the community and the environment, with unselfish goals is an obligation-as mentioned by a 'Wednesdayer'. If one persists in unselfish effort, overtime he will be recognized as a model or a selfless leader. We recognize unselfish leaders since diversity in nature is unified in harmony through universal love. How can we cultivate ourselves to be servant leaders? We need to keep our needs to a minimum and eliminate personal wants. This will simplify our life and make room for selfless service. This is ‘going beyond ego to universal self.’ Can you share a personal story that illustrates servant leadership? Leadership for unselfish material goals is important and valuable. However, in my experience, when the goal includes people, with patience, love and service attitude, we become servant leaders and impart such leadership qualities to others. ‘Wednesdays’ is a good example. I recently listened to a talk by Alan Watts where he happened to mention that Sanscrit, the 'perfect language', never referred to the word 'men' ( inclusive of women) as is commonly the use today. It referred to the expression 'human beings' through a name derived from the root name 'Manu'. Alan Watts quoted the precise name used in Sanscrit, but I am sorry to say that I have lost it...not the meaning! What does being a servant leader mean to you? It means karmayoga. That is, working for the community and the environment, with unselfish goals. If one persists in unselfish effort, overtime, he will be recognized as a model or a selfless leader. We recognize unselfish leaders since diversity in nature is unified in harmony through universal love. How can we cultivate ourselves to be servant leaders? We need to keep our needs to a minimum and eliminate personal wants. This will simplify our life and make room for selfless service. This is ‘going beyond ego to universal self.’ Can you share a personal story that illustrates servant leadership? Leadership for unselfish material goals is important and valuable. However, in my experience, when the goal includes people, with patience, love and service attitude, we become servant leaders and impart such leadership qualities to others. ‘Wednesdays’ is a good example. ... [View Full Comment] What does being a servant leader mean to you? It means karmayoga. That is, working for the community and the environment, with unselfish goals. If one persists in unselfish effort, overtime, he will be recognized as a model or a selfless leader. We recognize unselfish leaders since diversity in nature is unified in harmony through universal love. How can we cultivate ourselves to be servant leaders? We need to keep our needs to a minimum and eliminate personal wants. This will simplify our life and make room for selfless service. This is ‘going beyond ego to universal self.’ Can you share a personal story that illustrates servant leadership? Leadership for unselfish material goals is important and valuable. However, in my experience, when the goal includes people, with patience, love and service attitude, we become servant leaders and impart such leadership qualities to others. ‘Wednesdays’ is a good example. Thank you for the article; thank you, Vinoba for the metaphor(s); thank you, Be Happy for the response. I especially found the story of your grandmother and grandfather very moving. I wish our English language had a word, and maybe "humans" is it, for a gender neutral way to speak about ourselves. The longer the live the more I have a deep affinity for myself and others as human beings, first and foremost. I like, Vinoba Bhave, hold out great Hope for Humanity. It is about serving and being served. There is a saying, "If the people will lead the leaders will follow." In my view being a "servant" begins with self. Each person in their evolution must finally commit to a high standard of responsibility to self. This is how one serves Justice for all. How else can we have this precious commodity that is TRUST? We each have to resurrect our conscience. Abuse on every level continues - 90% of all prison inmates report they were abused as children. People teach what they know. Science calls this Epigenetics. Many of our institutions are populated by varying degrees of abused inner children including the religious. They too are as "guilty" of violating Trust. What if all had been treated with respect as children??? Would crime be as rampant? When people are disrespected repeatedly they become numb. Only someone numb can hurt others conscio... [View Full Comment] I like, Vinoba Bhave, hold out great Hope for Humanity. It is about serving and being served. There is a saying, "If the people will lead the leaders will follow." In my view being a "servant" begins with self. Each person in their evolution must finally commit to a high standard of responsibility to self. This is how one serves Justice for all. How else can we have this precious commodity that is TRUST? We each have to resurrect our conscience. Abuse on every level continues - 90% of all prison inmates report they were abused as children. People teach what they know. Science calls this Epigenetics. Many of our institutions are populated by varying degrees of abused inner children including the religious. They too are as "guilty" of violating Trust. What if all had been treated with respect as children??? Would crime be as rampant? When people are disrespected repeatedly they become numb. Only someone numb can hurt others consciously. Lack of conscience does not just occur on Wall Street and the Financial Industry but Madison Avenue whose Guru was Edward Bernays, the nephew of Freud. He is considered the "father of public relations/propaganda". Psychologists are paid to encourage our need to belong in the way ads are written. The Wonder Bra that women stood in line for in the rain overnight in So. Cal in 1991 was a twenty year old product!! It just had a new spin put on it and earned the Sara Lee Corp. many millions and marketing awards galore. We buy into this spin and more. We tech this to our kids A four year old knows the branding of McDonalds. Won't eat the real Mac burger wrapped in another label....but will eat an imposter in a Mac wrapper! A six year old runs home crying from first grade as she is not wearing Osh by Gosh jeans. A fifteen year old kills for a pair of sneakers. We like the spin, the hype, the show. We saw this with the mortgage loan debacle. People signed documents knowing they could not afford the payments. This is equally true for credit card debt. It is estimated that most families are over $15,000 in debt. Governments are still needed. Why? Too many on both sides of the counter try and cut corners in every sector. As evolving humans it seems we must be more discerning. We do not serve ourselves or others by making it ok that Big Pharma and Big Farma continues to create untrustworthy products and produce. How is it we also allow Chem trails and our water supplies to be polluted? Each of us must take back our power from people and from all the systems that do not serve us. Justice is an inside job and we serve ourselves by adhering to the way of the heart that is respect. In the so doing we serve others. Healing our own hurt inner child is the way to begin. This is the Hope I hold that will serve Justice for All. Vinoba wrote in English at a time when it was common to use the sweeping "men" to refer to both men and women. This has only recently changed. English was not his mother tongue. In the Indian languages, there tends to be an emphasis on "humans" over "men" and "women" - if he were communicating in his own tongue, this issue would not have come up as he would have used the term "manushya" for human. Be that as it may, I totally agree with the sentiment that women have tended to be our unsung servant leaders. No less a leader than Gandhi admitted that he had learned ahimsa from his wife. In my own life, my hero has been my grandmother, who was the rock of our family. Having her in my life has been my blessing. She would support my grandfather, who felt he was the star. He would write lots of books on spiritual matters, and she would be his humble typist. I took a summer vacation to go live with them when I was 15. I still remember that on... [View Full Comment] Vinoba wrote in English at a time when it was common to use the sweeping "men" to refer to both men and women. This has only recently changed. English was not his mother tongue. In the Indian languages, there tends to be an emphasis on "humans" over "men" and "women" - if he were communicating in his own tongue, this issue would not have come up as he would have used the term "manushya" for human. Be that as it may, I totally agree with the sentiment that women have tended to be our unsung servant leaders. No less a leader than Gandhi admitted that he had learned ahimsa from his wife. In my own life, my hero has been my grandmother, who was the rock of our family. Having her in my life has been my blessing. She would support my grandfather, who felt he was the star. He would write lots of books on spiritual matters, and she would be his humble typist. I took a summer vacation to go live with them when I was 15. I still remember that one day he got annoyed with her and told her, "You are not fit for me." She remained calm and equanimous, while I broke down, horrified. Both of them comforted me, with my grandfather feeling ashamed, and my grandmother telling me not to mind it. While my grandfather had a lot of intellectual clarity, my grandmother lived it. She not only supported her own family's journey but those of her neighbors and anyone else who crossed her path. Her prayer would not be, "may their suffering be alleviated," rather, it would be, "may their suffering leave them and come onto me." That kind of prayer requires a level of strength that I am yet to develop. Toward the end of her life, she called my grandfather on her deathbed, and told him that she was here so he could complete working out his own journey. He did not realize it, but that is what she had focused on all her life. He had to complete for her sake, and he had very little time left. For completion, he had to forgive everyone who he felt had wronged him, and let go of all grudges. Hearing all this, my grandfather, who always thought of himself as her teacher, broke down. He spent the next six months after her passing a changed man, following her advice and withdrawing from the world, after which he too passed on. Vivekananda used to strongly say that it was a terrible idea to discriminate between genders in spirituality - the spirit has no gender, and women don't need the permission of men to access their own spirituality. A beautiful and inspiring story comes to us from the Yoga Vashishtha, which tells us of King Shikhidhwaj and Queen Chudala. The queen was far ahead in spiritual matters. One day her husband announced that he was done with the material world and would go to the forest for enlightenment. She told him to go right ahead and she would take care of the kingdom. This being an Indian story, and that too a Yogic one, she could see in meditation that her husband was totally miserable in the forest, being bitten by flies and far away from renunciation. She knew that if she went and instructed him, he wouldn't take it. So, she changed her form to that of a male hermit, and then told him, "You are doing it all wrong." His mind opened up enough to receive instruction from his wife, who then helped him to realize that waking up required separation from the ego, and just by virtue of being in a forest, he wasn't going to get there. This is a remarkable story, quite unparalleled in the Yogic tradition. I feel that modern efforts for gender equality in language are good as far as they go, but they don't go far enough to celebrate the unique strength and wisdom that women servant leaders have shown us. I must end by celebrating CFMom, who (along with CFDad) serves as a rock for Wednesday meditations, no matter what her health is, so we may all further our journey. It is no easy task to cook for so many people, and she has done this for 15 years now! Her gratitude at being of service deepens our own commitment to servant leadership. Does it matter that this article refers only to men? I always read (wo)men and all as non gender. We are people, hearts of this earth, all chosen to be here at a time of great change to be part of the path of light. To light up the day sky as well as the night and serve with love in our hearts and a deep compassion and empathy to all we serve. In Love and light. I also was stopped in my reading by the pronoun "men," and a quick scan revealed "women" were not referenced. Vinoba Bhave was born in 1895 and writes from that culture. Women have historically been the stars, always the servant leaders behind the scenes. One woman to break through the glass ceiling in an election was Indira Gandhi. I very much agree with the concept of servant leader. I have always enjoyed the material you send out. But this time I feel very disappointed, the emphasis being on great MEN. Women are most often servant leaders in their approach. Women are needed to change this world. Thank you for offering the opportunity of reading this excellent article from Vinoba and the many interesting comments. My whole heart understands and agrees with this perfect piece of writing on serving AS leadership. And I do hope that soon a writing like this which only refers to "great men" as leaders or servants will simply understand that it is becoming a "great human" whether woman or man that humanity is truly served. With the tiny wills reflecting on His perfection! But about the million monkeys that fought the battle without a weapon! And a few faces in the crowd! But just people, dirtying their hands at work on earth, as the altar! But about God discovered, in a million hearts - all at once and how! Thought provoking article. Vinobaji influenced masses by "Bhudan Yagna" and by his beautiful commentary on Bhagvad Gita...Vinobaji and Gandhiji both took a lot from Bhagvad Gita...They both considered themselves as servants of people and became true leaders. Another name in the same spirit was Lal Bahadur Shastri.... He was Chief Guest for the convocation at University of Roorkee ( now IIT-R ) in 1965. He led the country to self sufficiency in food grain and milk...He led from the front, winning the war with Pakistan in 1965...He used to regard himself as servant and became true and loved leader....I felt great honor to be a part of NCC- EME core to give him guard of honor !!! I only wish that our current leaders earn their true leadership by first bein servant and not bosses ! Servant leadership - to me - means leading without any thought of gain or recompense, but instead doing what needs to be done solely because it is right. In order to act in this way, one must be prepared to focus on what your heart tells you is just and correct, instead of seeking external validation for one's actions from society or religion. What a nice way to depict servants as stars in the moonless night. I have been fortunate to have had a supervisor at work and a professor in university that shared and lived their values and inspired the best in me. I will keep their examples and the stars in mind at the workplace this week. Thank you! Enjoyed this reflection, Vinoba . . . Thank you! The greatest servant leader EVER to walk earth . . . of course, would be Jesus, Himself! In teaching leadership, Jesus "served"! In SERVICE, Jesus LED! Be the "work" as basic/common as washing His brother's feet or as miraculous/Divine as raising a friend from death . . . NOTHING was "outside the job description" of God's Son! Again and again, God shows us, our time here on earth is SO short. He did not intend for our earthly lives to be any "sweeter" than Jesus' was. Jesus got tired . . . Jesus questioned His Dad . . . Jesus cried . . . Jesus got angry . . . Jesus wished for painful things "to come to pass" . . . BUT . . . Jesus, also, LED (and you/I must, too) PEOPLE TO HEAVEN . . . Jesus SERVED (you/I must, too) PEOPLE ON THIS JOURNEY to our "real home" . . . HEAVEN. Love bears all thing... [View Full Comment] Enjoyed this reflection, Vinoba . . . Thank you! The greatest servant leader EVER to walk earth . . . of course, would be Jesus, Himself! In teaching leadership, Jesus "served"! In SERVICE, Jesus LED! Be the "work" as basic/common as washing His brother's feet or as miraculous/Divine as raising a friend from death . . . NOTHING was "outside the job description" of God's Son! Again and again, God shows us, our time here on earth is SO short. He did not intend for our earthly lives to be any "sweeter" than Jesus' was. Jesus got tired . . . Jesus questioned His Dad . . . Jesus cried . . . Jesus got angry . . . Jesus wished for painful things "to come to pass" . . . BUT . . . Jesus, also, LED (and you/I must, too) PEOPLE TO HEAVEN . . . Jesus SERVED (you/I must, too) PEOPLE ON THIS JOURNEY to our "real home" . . . HEAVEN. Love bears all things . . . Love hopes all things . . . Love believes all things . . . Love endures all things . . . Love goes on Forever. Because He Did, may we, too! Hang on faithful servant leaders! Twinkle . . . twinkle . . . you/we are STARS! COMBINED . . . let us SHINE! Thank You Jesus for giving us each other!